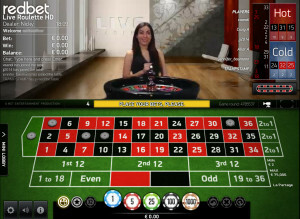 La Partage is a feature that is offered to players on some games of European Roulette, where half your stake is returned if you have placed an even money bet (Red/Black, 1-18/19-36, and Even/Odd) and it loses by the ball landing on Zero. This is quite significant for the player as it reduces the house edge on the game so you should always try and play Roulette with La Partage if you can. It’s not immediately obvious that a live casino offers la Partage. The way to tell is if they have French Roulette or French Gold Roulette tables. These have the French layout, it’s still European Roulette but La Partage is active if the ball lands in the Zero and you have made an even money bet. Not all the live casinos using Net Entertainment have the La Partage rule switched on. The great thing though with the Net Entertainment solution is that it’s available in both French and normal table layouts, whereas the others only offer it with a French table layout. Of the ones promoted on Live Casino Comparer, Redbet and Comeon both offer it, but you have to switch the facility on before you enter the game by checking a tick box. When this is checked the minimum bet for the table will increase from £1 to £2. No great shakes really. Out of the two I’d probably play at Redbet, because cash out times are one of the quickest about, although you do get loyalty points when playing at Comeon. The La Partage rule is hidden away on the French Roulette tables. The tables to look out for are the “French Roulette tables“. You’ll almost certainly find that the same dealer is being used on both a French and standard table layout. The only difference is the computer generated table imagery and of course one has La Partage and the other doesn’t. You have the choice of a number of Playtech Live Casinos, Paddy Power and William Hill. Pick of the bunch for me is the table at Paddy Power as it offers a good range of betting options with William Hill running it a close second mainly due to them also having an Evolution Casino that also offers La Partage. 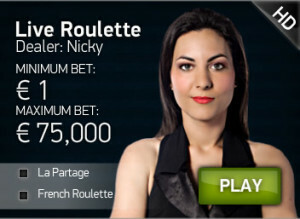 La Partage can be found on the French Roulette Gold tables at Unibet, Bet Victor, Grosvenor, William Hill, Come On and Redbet. William Hill and Grosvenor edge it for me, but honestly all are very good. As I mentioned above not all of the live casino software suppliers have the facility to offer La Partage. Surprisingly Microgaming head the list followed by Amaya, MediaLive, Wirex, Global Gaming Labs and Visionary iGaming of software vendors who do not offer La Partage.